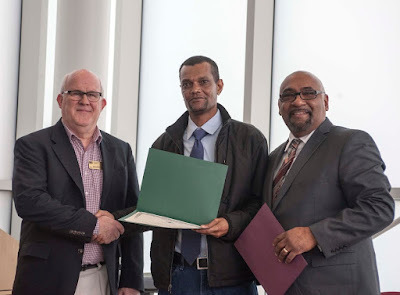 Ethiopian refugee Kafar Hassan's dream is coming true. Forced to leave his son Robel behind in Johannesburg, South Africa where they had found safe haven for several years, Kafar arrived in Hartford's Asylum Hill neighborhood in 2013 when resettled by local Catholic Charities Migration, Refugee and Immigration Services. 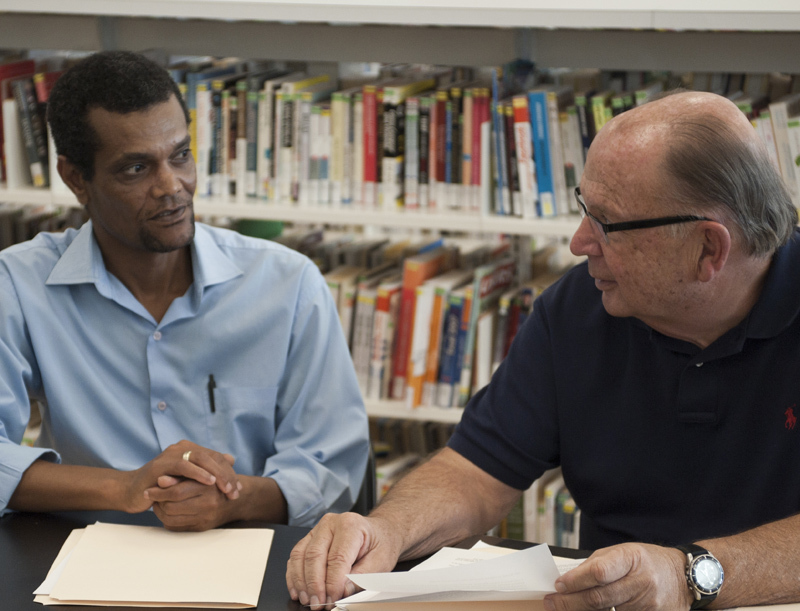 In Asylum Hill he found welcoming support and eventually an opportunity to succeed. 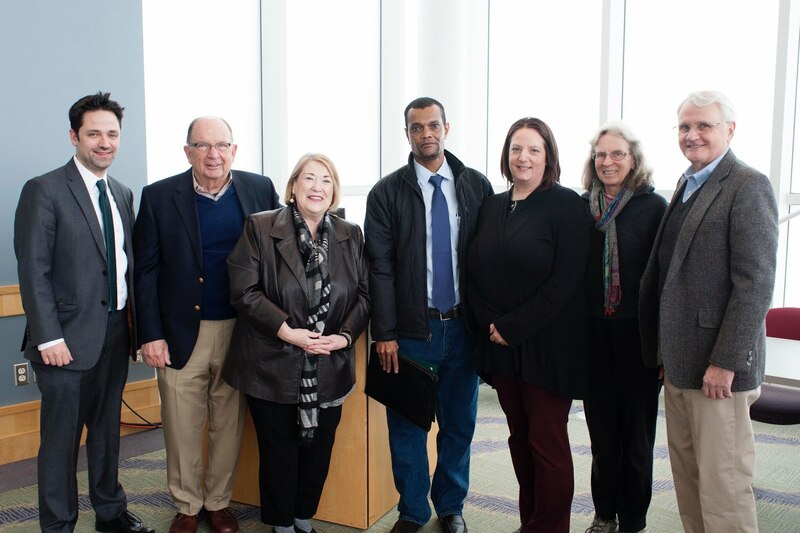 A life saving network of Hartford organizations and individuals collaborating to focus Kafar's commitment to succeed led to his March 24, 2017 graduation from Manchester Community College's Precision Manufacturing Program. With a hard-earned career-advancing cerification in hand, coupled with a good paying highly technical manufacturing job starting March 27, Kafar's dream of reuniting with Robel is closer than ever. 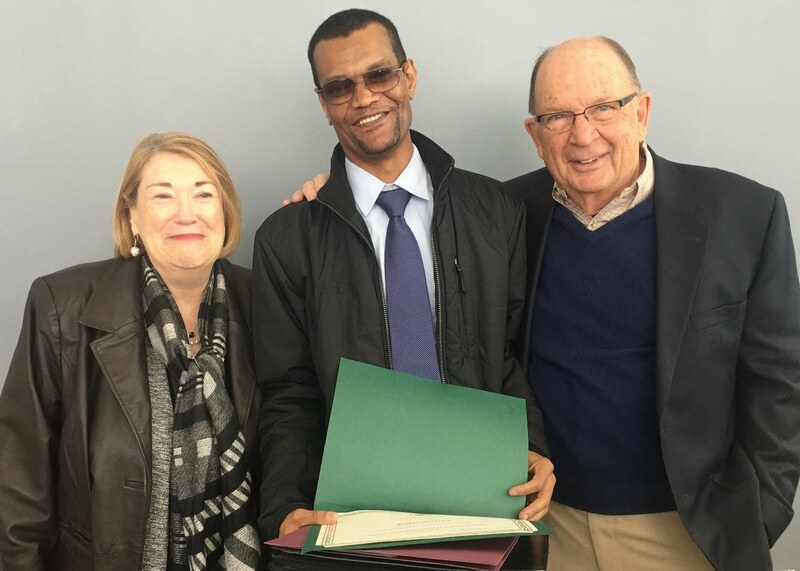 Attending Kafar's graduation was an uplifting highlight for me and several other members of the Asylum Hill Neighborhood Association's (AHNA) Welcoming Committee there to cheer him on, and congratulate him for a job well done. 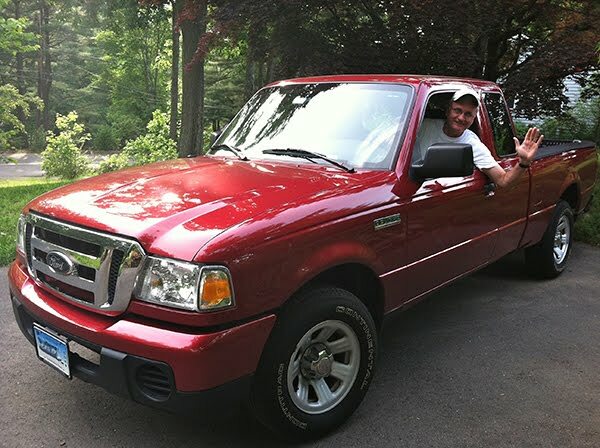 Kafar's success and the team that cleared his path is featured in guest blogger Tim Blonsky's article that follows. Tim is Advanced Manufacturing Coordinator at Capital Workforce Partners. 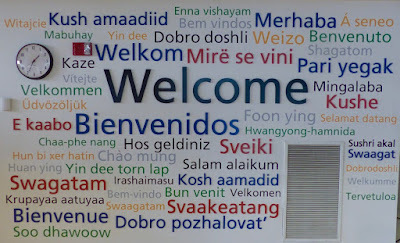 His article highlights what can be accomplished when a community comes together to welcome a newcomer. Be inspired. Be encouraged. Be energized. Capital Workforce Partners, working with partners from education and business, is pleased to announce the successful graduation of a number of previously under- and unemployed individuals who received certificates in Precision Manufacturing CPM/CAM 4 from Manchester Community College’s (MCC) Great Path Academy program on Friday, March 24, 2017. Capital Workforce Partners’ Advanced Manufacturing Program, made possible by both federal and state grant investments, has led to ten participants successfully graduating on March 24 who will be placed in manufacturing jobs. This program is meeting one of the greatest challenges facing advanced manufacturing today -- a labor shortage of trained workers much needed to sustain growth. The current generation of incumbent workers nearing retirement is leading to the critical need for the next generation of well-trained, advanced manufacturing workers. In response to the need to support both interested job seekers, as well as advanced manufacturing employers, Capital Workforce Partners, working with its education and training partners and 45 manufacturing companies, have helped over 220 adults to get manufacturing credentials and/or jobs in the Manufacturing Industry. This program also provides a great opportunity for low-income individuals to pursue job training as a ladder out of poverty which will have a huge impact on their lives and those of their families and communities. One of the graduates is Kafar Hassan, a resident of Hartford and refugee from Ethiopia, who came to Hartford five years ago via South Africa with the goal of establishing himself before bringing his wife and son stateside. “Kafar proved to be one of our more dedicated and committed students right from the start. He always showed up to class on time and his approach to the classroom and machining labs was always with a winning and positive attitude. Strong class participation, aptitude, preparation and excellent program results were rewarded with a successful interview and an excellent first step in a manufacturing career at EDAC Technologies in Newington,” said Dave Russell, Manufacturing Program Director at MCC. Kafar Hassan was born forty years ago in Jijiga, Ethiopia. He was raised by a single mother after his father was killed in ongoing tribal fighting. She and her family placed him in a seminary school in Nazareth, now known as Adama. There he completed high school and began his post-secondary education. However, because of continuing political strife and fighting, Kafar fled to Durban, South Africa in 1991. When Kafar arrived in Durban he volunteered with various human rights organizations eventually co-founding “International Refugees Services,” which was featured in a 2001 L.A.Times article. After seven years serving the needs of refugees, he was awarded a scholarship to the University of Kwa-Zulu Natal in Durban. While pursuing his studies he encountered difficulties in Durban and moved to Johannesburg where he made the decision to seek asylum in the United States. The process took about seven years during which time he met and married his wife Benicia. Their son, Robel, was born in 2008. 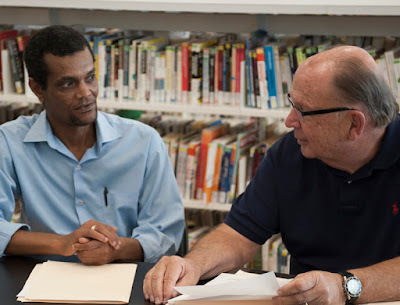 Resettlement to America became a reality in 2013 through Catholic Charities' Immigration and Refugee Resettlement Program though to meant leaving Benicia and Robel behind to follow him later once he was settled. Kafar's relocation to the United States initially placed him in Hartford’s Asylum Hill neighborhood. Through Hartford Public Library's Cultural Navigator Program, which supports the transition of new arrival immigrants and refugees, Kafar was introduced to and welcomed by members of the Asylum Hill Neighborhood Association (AHNA), as well as matched with a dedicated volunteer mentor, Dean Amadon, from the Asylum Hill Congregational Church. Over the past few years, Kafar and Dean formed a partnership focused on supporting Kafar’s determination to move forward. Nancy Caddigan from Hartford Public Library and Dean Amadon congratulate Kafar Hassan. Heartbreakingly, Benicia became ill with cancer and passed away in 2015, leaving his son to be cared for by relief workers in South Africa. Until recently Kafar was earning an hourly wage of less than $10.50 at a small, local company -- not enough to allow saving for the fare to bring his son to the United States. But a solution was in the works. Through an introduction orchestrated by Dean Amadon, Kafar was referred to Capital Workforce Partners where he was introduced to the Advanced Manufacturing Training program at MCC. The program provides entry level CNC Machining training, placement assistance, and an accredited certificate upon successful program completion. To support his participation in the training program, a number of individuals generously contributed to Kafar’s tuition and living costs. Kafar was a member of Friday's graduating class. His academic success enabled him to be hired by EDAC Technologies in Newington in a position with opportunity for growth. With the good fortune of beginning his new career immediately upon graduation, Kafar now has the means to pay his son's way to the United States. His dream of having his family brought together again may be realized soon. A bright future is on the horizon for Kafar and Robel. Rio Comaduran, Jennifer Cassidy, and Don Shaw, Jr.
For people on the list to receive a kidney transplant the path is long and arduous, marked with anxiety and frustration. As one would expect for anyone with a serious chronic illness personal and family stress is high, often debilitating. 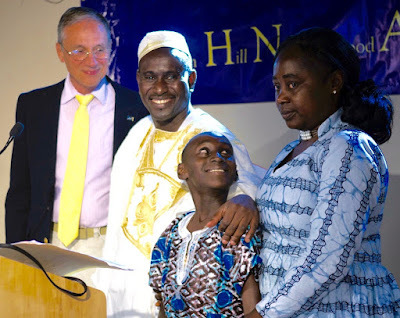 In January I wrote about Georges Annan Kingsley's desperate need for a kidney transplant, and his leadership in promoting the need for more people to become Living Donor Champions. My blog today features Bernie Michel's story as he follows Georges' lead to learn more about living donor programs, and the possibility of becoming a kidney donor. Like Georges, Bernie is an Asylum Hill resident. He is a long time community leader active in the Asylum Hill Neighborhood Association (AHNA). For those of you who are regulars at AHNA meetings, or the Welcoming Committee, or who read the RedTruckStonecatcher.com blog, it is no secret that Georges Annan Kingsley, the refugee and artist from Ivory Coast who has been on dialysis for more than five years, needs a kidney transplant. His kidneys stopped functioning several years before he came to Hartford. Last month when he began explaining the process to me, I made a commitment to understand what really is involved in the process. Here's what I've done and what I've learned. First, I had one very in depth conversation with Asamoah “Azzy” Anane, Living Donor Transplant Coordinator at Hartford Hospital, where Georges goes three days a week for dialysis. Dialysis is the only reason Georges is still alive. The days when he receives the treatment are split between the hours of dialysis itself and the time spent recovering from the treatment. As good as the technology is, it’s a poor substitute for a functioning kidney, so Georges’ truly productive life consists mainly of the days between dialysis. Becoming an organ donor is an opportunity available to most of us just by checking a box on our driver’s license or signing up online. It's easy and certainly painless to do since you don’t part with any organs until you’re done using them. However, when it comes to kidneys there’s another option, the opportunity to become a living donor, which is what I'm looking into for myself. Nearly everyone has two and can usually survive just fine on one. Giving a living part of oneself to someone else is a special kind of giving. It’s more than writing a check or even volunteering weekly or monthly. Of the more than 120,000 people in America waiting for an organ transplant, more than 80% need a kidney. From the medical point of view, a living donor is preferred by far. It may take several months to be sure that the kidney donor and the recipient are the best possible match, but it greatly improves the chances of everything going as planned for both the donor and the recipient. The financial burden of being a donor is covered either by the recipients insurance or the National Kidney Foundation, including all the testing needed to be sure the donor is healthy enough to safely provide a viable organ to the recipient. To be sure the process does take significant time. However, on the plus side you get a physical like no other at no cost. Blood tests for everything under the sun as well as all your other vital organs as well. Then, if everything is a go and you actually do donate a kidney (only about 10% of those who volunteer are accepted), then you can expect 4-8 weeks to recover. Going from two kidney’s to one is a bit of a shock to the system. For one thing, it requires volunteering to experience some temporary pain and discomfort. Medical science gets better every year, but they still haven’t eliminated pain and discomfort. Yet despite the short term personal physical distress, the whole process is absolutely worthwhile because the recipient goes from none to one and is usually feeling much better in a day or two, mostly because he or she hasn’t felt well in a while. At the end of my conversation with Azzy I asked what the next step would be. He said I need to begin with an application, which he emailed to me. Statistically I have about a 1 in 10 chance of being able to donate, and if I’m successful I’ll be at the upper age range of donors. Even if I’m not compatible with Georges, being willing to donate for him improves his chance of receiving a kidney by a lot. I’ll talk more about that next month in Asylum Hill News & Views. In the mean time, if you can’t wait until next month’s installment, you can reach out to Azzy at asamoah.anane@hhchealth.org. Scared, scammed, stressed, and searching. That's how many of my immigrant and refugee friends feel. Scared because America's current political climate fosters fear of the stranger, and rejection of minorities. Scammed because too often immigrants and refugees coming from authoritarian and repressive countries don't know whom to trust. They get ripped off by intimidating imposters posing as law enforcement agents, government officials, or legitimate businesses whose aim is to rob them of their money and possessions. Stressed because they feel alone, exposed, unprotected, and unwelcome, not knowing whom to turn to for assistance which ranges from where to shop, how to navigate transportation, where to receive medical treatment, how to find a job, or where to secure sound legal advice, among many others. Searching because they want answers, guidance, support, and much needed acceptance and encouragement from their local community. So how do we answer these cries for help? Become a welcoming community, and follow Hartford Public Library's lead. Having worked several years for the City of Hartford, as well as having worked with many non-profits in Hartford's neighborhoods, I've seen a lot, heard a lot, done a lot, and learned a lot about Hartford's new arrivals, especially in the city's Asylum Hill neighborhood. Hartford is a welcoming community. Mayor Luke Bronin and City of Hartford leadership have made that emphatically clear. Asylum Hill is representative of the city's many neighborhoods in extending its welcoming arms to immigrants and refugees. Most recently it opened its Asylum Hill Multicultural Resource Corner at Catholic Charities Asylum Hill Family Center to serve all neighborhood residents, particularly newcomers. Yet, long before the current social and political turmoil one organization in particular, the Hartford Public Library, invested significant resources to become a leading light and steady hand in supporting Hartford's newcomers. Encouraged in recent years by innovative CEOs Louise Blalock, Matthew Poland, and currently Bridget Quinn-Carey, Hartford Public Library has achieved a national reputation for its immigration and citizenship programs. 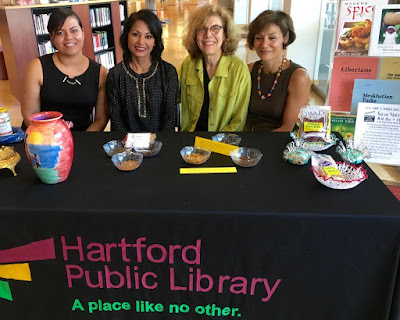 So much so that it enabled Homa Naficy, the library's Chief Adult Learning Officer and former Connecticut Immigrant of the Year Award recipient, and her team to implement Hartford Public Library's immigrant support initiatives. As a result of her leadership, she was chosen a 2013 Champion of Change by The White House. As a guide to following Hartford Public Library's lead, the information offered below is excerpted from the Library's website. Please follow the links as cited for detailed information on the following points. Strategy 1: Recruit and train volunteers to serve as Cultural Navigators. These mentors are integral to easing the transition of newly arrived immigrants into their home city, Hartford. Strategy 2: Build coalitions among key stakeholders. The Immigrant Advisory Group (IAG) serves as a city-wide vehicle for stakeholders to communicate current immigration issues and share best practices with each other. It is also a forum for participants to learn about immigrant cultures and experiences. Strategy 3: Engage immigrants and the receiving community in Community Dialogues on topics of mutual concern. There are various approaches to this, but all lead to a plan of action. Hartford Public Library has piloted two approaches: City Wide and Neighborhood. Strategy 4: Bridge cultures through facilitated book group discussions and films that portray the immigrant experience and its often complex cross-cultural dynamics. Strategy 5: Foster the value that regardless of where you come from, Hartford welcomes you. 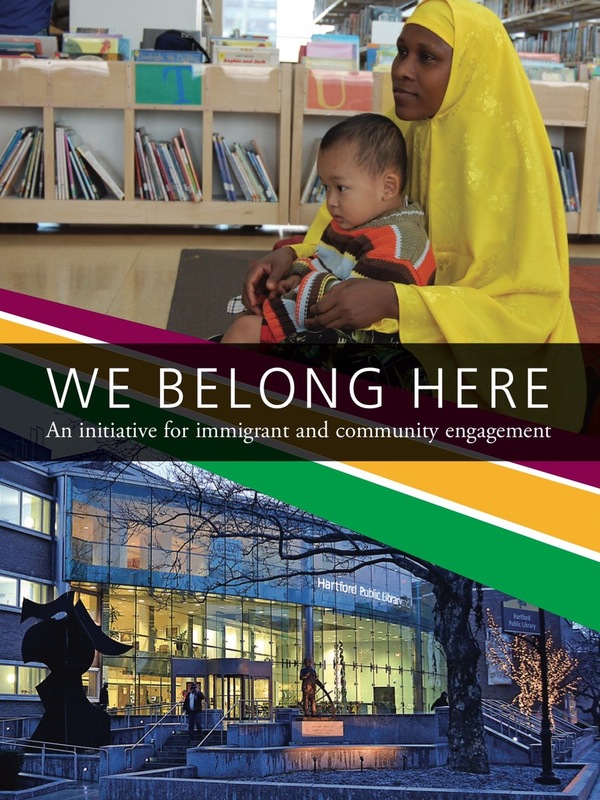 Follow the steps in We Belong Here, the library's toolkit for welcoming and supporting new arrival immigrants. Hartford Public Library (HPL) Downtown Branch (500 Main Street) is recognized by the US Department of Justice, Board of Immigration Appeals (BIA) to offer legal advice by its BIA accredited representatives. Only Attorneys or BIA Accredited Representatives can provide legal advice. Notary publics, businesses, immigration consultants are NOT able to give immigration legal advice. THE WRONG HELP CAN HURT! Follow the Legal Help link above for more details. There are many agencies and organizations providing much needed support to immigrants and refugees, as well as support to advocates and volunteers who sponsor them. However, it is clear to me that America's current social and political environment makes it imperative to engage more people in understanding the plight of immigrants and refugees. It's critical to providing the necessary care essential to embrace them into our lives, our communities, and our country. The inscription on the Statue of Liberty reads: "Give me your tired, your poor, your huddled masses yearning to breathe free, the wretched refuse of your teeming shore. Send these, the homeless, tempest-tossed to me, I lift my lamp beside the golden door!" Let's live our American ideals. Let's welcome the stranger.